Today, Shawn took Erin to GeekFest..or, GeekCon - Geek-a-palooza? 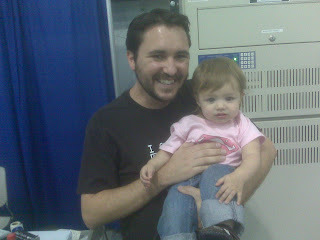 When I was 12, I had a HUGE crush on Wil Wheaton. HUGE. I liked him so much, I wanted to, like, KISS him. (*gasp*). As I look at this picture, I wonder what would have happened had my 12 year old self had her way. First of all, there's no way my daughter would have been as cute as she is. I mean, as cute as Wil is (yeah, and he still looks pretty cute 18+ years later), my husband is WAY cuter. No contest. Secondly, there's no way he could love my child as much as Shawn does. That's because nobody else could - ever. Oh, and hello to the mommy bloggers that may have made their way over here from Backpacking Dad, and who secretly wonder what kind of chick snagged such a great guy. It's me - my interests include Otter Pops. Mommy blogger popping over to say "hi." I have a large purse, but I'm pretty sure I'm not fabulous. Maybe it's stilletos? Hmmm - maybe it's a large purse you actually never carry anything in? Nope, I carry a large purse with nothing in it, and I'm not fabulous either. Crud. Guess the high uncomfortable shoes comment was already played out over here at this post. Who the hell is Wil Wheaton? Why do I live in a hole? haha, jeramie and i went to this scifi con here in sacramento about a month ago. wil was there along with a couple star wars and battlestar related people, which is what we went for. it was really fun, the coolest was probably ernie fosselius.